Las Vegas, USA -- In the final years of his life, UPF founder Rev. Dr. Sun Myung Moon initiated a project in Las Vegas aimed at offering a new vision for peace and human development to world leaders. He sometimes called it his "Shining City" project because he hoped it would help change the reputation of Las Vegas from "Sin City" to a city of educational enlightenment. He proposed the realization of a major educational institution for world leaders where they could take inspiration from UPF's worldview along with both the natural wonders of this area such as the Grand Canyon and from the monumental achievements of human ingenuity such as Hoover Dam and the creativity of Las Vegas itself. Indeed, Las Vegas has changed its vocation from that of a simple vacation getaway to the world's most popular convention and event venue: every year the city hosts over 21,000 conventions and events. With over 140,000 hotel rooms available, more than 40 million visitors stop in Las Vegas annually. Major corporations hold expos and trade fairs there to show off their newest products, and it is believed that the resulting billions of dollars in new cash sales and deals made in Las Vegas each year surpasses even Wall Street. Dr. Moon saw this as an ideal environment to bring leaders of the developing world for a chance to study UPF's world vision and at the same time to mix and mingle with people who have the heart to share the prosperity and technology of America with those who have the greatest needs. Following this vision and also as follow-up to the first World Summit of UPF International held in Seoul, South Korea, in February 2013, UPF-Africa worked together with the son of the UPF founder, Mr. Kwon Jin Moon, and with the staff of the International Office for Education and Development set up by UPF-International in Las Vegas to host three major events in 2013 involving two First Ladies and other dignitaries and leaders from African countries including many who had participated in the World Summit. 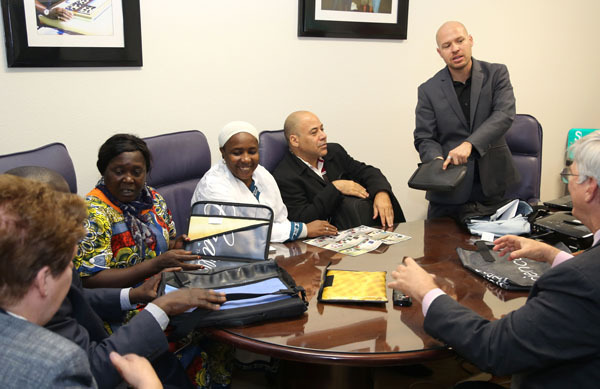 On June 15, 2013, UPF hosted a delegation led by the First Lady of the West African Republic of Mali, Mrs. Mintou Doucouré Traoré. Mrs. Traoré was received by the mayor of Las Vegas, Mrs. Carolyn Goodman, as well as many other local dignitaries and business leaders. She listened to UPF's educational presentations on the legacy of peace left by Dr. Moon as a possible solution to the ethnic and religious conflicts in her country. She was awed by the Grand Canyon and other inspirational sites. And through contacts of UPF, she received a donation of nearly 2 million dollars worth of educational materials for her own humanitarian organization in Mali. From October 28 to November 2, the same UPF organizers helped UPF-Nigeria chapter bring a group of 13 Nigerian dignitaries and Ambassadors for Peace to Las Vegas. These religious, political, business and educational leaders came to the "Shining City," completely self-financed, to study UPF's principles of Peace and to meet academic leaders at the University of Nevada-Las Vegas. UPF President Dr. Thomas Walsh spoke to them at the start of their six-day program about the history and background of UPF worldwide. Mr. Kwon Jin Moon also spoke to the participants about concepts related to peace and conflict resolution. UPF International's education director Dr. Tony Guerra as well as staff from UPF-Africa gave presentations and led lively discussions on UPF's principles of peace. As with the First Lady of Mali, the group was also able to visit the Sky Walk over the Grand Canyon in the Hualapai Reservation. However, this time there was an unexpected treat: the Nigerian delegation was surprised on the Skywalk by a dance troupe sponsored by the Hualapai tourism office dressed as 'Zombies' who performed a "flash mob" dance in the midst of the group to the music of Michael Jackson's Thriller. The delegates had fun dancing with the group and playing along for the cameras. The delegation also spent an evening out on the town to see the world-famous Cirque du Soleil performing "O" at the Bellagio Theater, and they visited Hoover Dam on Lake Mead. The seminar ended with a special event at the UNLV Student Union Theater that included a bridge of peace ceremony, a panel discussion on overcoming adversity through service to others, and an award ceremony in which nine Nigerian and American dignitaries were appointed UPF Ambassadors for Peace in recognition of their outstanding community service. Only a month later, from November 27 to December 2, the UPF 'Africa Team' received another distinguished First Lady from West Africa. Mrs. Isolina Da Fonseca Nhamajo, the wife of the president of Guinea Bissau, came to Las Vegas with a delegation that included the former Ambassador of Guinea Bissau to the United States who is now a presidential advisor and the head of the First Lady's own charitable organization called "Fundacao Firkidja," which in Portuguese and Creole simply translates "Support Foundation," helping handicapped women and youth. Dr. Thomas Walsh flew in to Las Vegas to greet the First Lady and offer her delegation a presentation about UPF worldwide. As with the other delegations, Mrs. Nhamajo followed the presentations of UPF's vision for world peace and development through education, offered by Mr. Kwon Jin Moon and Dr. Tony Guerra. Mrs. Nhamajo also attended a special fundraising dinner in her honor to support the work of Fundacao Firkidja. At the dinner she was honored with special citations from the office of Senator Harry Reid and from the Las Vegas City Council. She, in turn, offered hand-woven traditional cloths to Mr. and Mrs. Moon, to Dr. Walsh and to Mrs. Katherine Harting Rigney, the Chairman of UPF-Africa, and to the founder of Re-Purpose America, whose Las Vegas-based company is offering several containers of recyclable materials to the First Lady's project in Guinea Bissau. Re-Purpose America is an outstanding example of ingenuity and resourcefulness: every month hundreds of companies buy hundreds of thousands of dollars worth of vinyl signage to advertise before and during conventions that rarely last more than a week. At the end, all this material is discarded. Re-Purpose is paid by these companies to remove the material, but instead of destroying it, they have developed ways of recycling the material into items such as school bags for children or tents for emergency relief organizations. They have even built an entire warehouse out of recycled materials for their own use. Now, Re-Purpose wants to offer materials to the First Lady of Guinea Bissau and train people in her organization how to use the materials to produce valuable commodities, thus teaching job skills and creating an industry that can help people in Africa. Dr. Hak Ja Han Moon, co-Founder of UPF, has offered to pay for shipping the first container of materials from America to Guinea Bissau. Other donors are joining in. Through personal meetings with people like the founder of Re-Purpose America, the First Lady was able to forge relationships that can have a significant impact on her country of 1.5 million people. And in the process, Las Vegas is truly able to contribute to relieving the suffering of countless underprivileged people a world away in Africa – providing a beacon of hope that makes Las Vegas the "Shining City" our UPF Founder had dreamed of and worked for. Mrs. Nhamajo and her entourage were also treated to a visit to Hoover Dam and to a night out at the MGM Grand Theater to see "KA" by the Cirque du Soleil.